I disagree with Andrew Davies’ conclusion  that there’s no need for a rethink of navy’s basing. The RAN must have a long-term plan to move out of Garden Island. Continuing to have a major naval base within a stone’s throw of the central business district of a large city is frankly ridiculous. Other navies closed their naval bases in or near large cities years ago. Examples include Mare Island in San Francisco, the Brooklyn Navy Yard in New York, and the Chatham and Sheerness Dockyards near London. The reasons why these bases closed are exactly the same as why other large industrial undertakings have been moved out of inner Sydney. It’s an anachronism that Fleet Base East and Garden Island Dockyard are still there. The Fleet Base should have moved years ago. We need to be clear about what we are talking about. There are two separate facilities at Garden Island – Fleet Base East and Garden Island Dockyard. 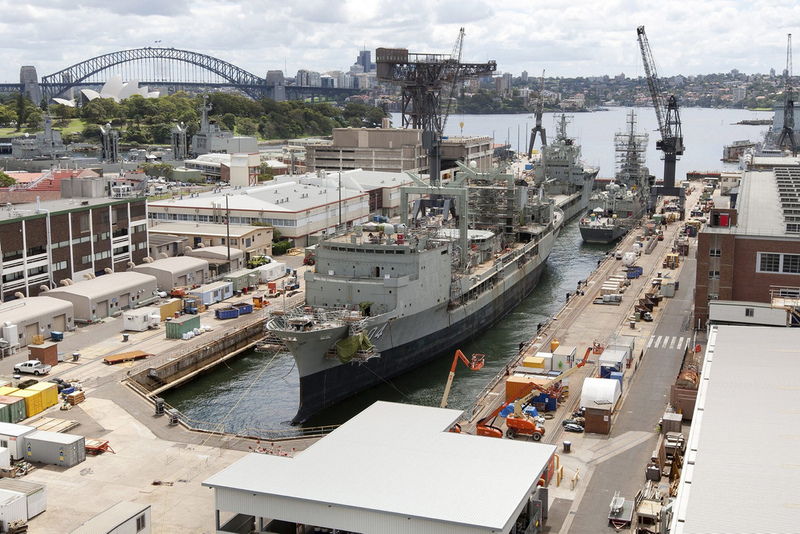 Fleet Base East (HMAS Kuttabul) comprises Maritime Headquarters, the Navy’s administrative and logistic centre at Potts Point and the adjacent wharf facilities at Wooloomooloo. It’s a highly congested site with no room for further expansion. Any attempt at expansion would be strongly resisted by local residents. Garden Island Dockyard is managed and operated as an independent commercial entity by Thales Australia. It comprises Captain Cook graving dock, a floating dock and a range of engineering and maintenance facilities. The area of Garden Island occupied by the dockyard is now smaller than it was previously with some land being given back for public use and as a heritage site. My concern is primarily with the location of Fleet Base East. The dockyard poses additional considerations, including its increased use by commercial shipping. When Andrew says it’s prohibitively expensive to consider a move of Fleet Base East out of Sydney, he is looking only at the direct costs. A full benefit-cost analysis of the indirect costs, as well as the opportunity costs of using the Wooloomooloo wharves and the Potts Point site for other purposes, may reveal a different picture. The indirect costs include the congestion costs associated with the movement of naval personnel and stores through city traffic into an inner city location. It’s environmentally unsound and potentially hazardous to have large warships berthed so near to the densely populated areas of Kings Cross, Potts Point and Wooloomooloo. Personnel issues also need to be considered. Senior naval officers might be able to afford accommodation close to Garden Island but junior officers and sailors are forced to live in outer suburbs with a long commute to work. Parking near Garden Island is notoriously difficult. The RAN must have a plan to move out of Garden Island. Brisbane is the only realistic option. Last year’s Australian Defence Force Posture Review  got it right. Jervis Bay ceased being an option when the area was declared a national park in 1992. Newcastle and Port Kembla have similar problems to those of Sydney. North Queensland locations are unsuitable for a variety of reasons not least because they lie in the cyclone belt. The lower reaches of the Brisbane River provide several possible sites. Defence should move quickly to secure suitable land. Sam Bateman is a senior fellow at the S. Rajaratnam School of International Studies at Nanyang Technological University in Singapore. Image courtesy of Flickr user Horatio J. Kookaburra .